Meaning: First month of spring. It seems it was spring time when the name was given. 1. The Holy Prophet was born in this month as mercy for all and departed from this world 63 years later. 2. The Holy Prophet migrated from Makkah to Madinah Munawwarah. 3. Battle of Buwaat took place in the year 2 A.H.
4. Battle of Saf’vaan took place in the year 2 A.H.
5. Abu Bakr’s(R. A) daughter, Asma (R.A.) was born 6 years before Prophecy. 6. Ruqayyah (R. A.) the daughter of the beloved Prophet was born 7 years before Prophecy. 7. Abu Bakr (RA.) was appointed Caliph. 8. 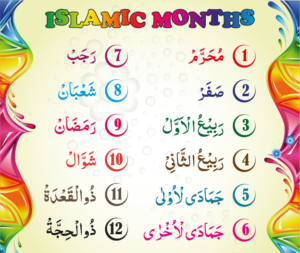 Hadhrat Umme Kuithum was married in this month to the third Caliph; Uthman (R.A.) in 3 A.H.
9. Wife of the Holy Prophet Zainab (RA.) passed away in the year 4 A.H.
10. Ibrahim (RA.) the son of Maaria Qibtiya & of the Holy Prophet passed away in the year 10 A.H.